Our youngest child is 14 years old today. Sam's birth seemed like it was going to be another clockwork delivery. But the little guy squirmed around in the womb and went breech early in labor. The position in which he chose to present himself to this world required a Cesarean section (the only one of Becky's four deliveries that required medication). So, Dr. Cheryl Cowles, a friend, presided over the C-section as I watched, holding Becky's hand. Before long, Cheryl lifted up this squirming little bundle in the palms of her hands. Our fourth was a boy. And another cause for joy. Happy birthday, Sam! 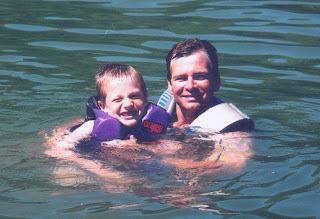 Photo: Sam and I take a dip in the water at Lake Monroe on a hot summer day. Sam must be about six years old in this photo.